The Stratosphere Hotel Las Vegas is that tall structure you can't miss if you are at the north end of the famous Las Vegas Strip. It is now owned by a Golman Sachs subsidiary, Whitehall Street Real Estate Funds, which bought the hotel and casino in 2008 for $1.3 billion. The Stratosphere Hotel Las Vegas is within two miles of downtown Fremont Street, the Las Vegas Convention Center, Madame Tussauds, and the Fashion Show Mall. It is also in close proximity to Red Rock Canyon National Conservation Area, Valley of Fire and Mt. Charleston, as well as numerous golf courses. 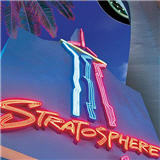 The Stratosphere was originally conceived in the 1990's by Bob Stupak to replace his Vegas World Casino. At the start of the project, one of the planned rides was a King-Kong like ride where a giant ape would carry you up and down a tower on top of the building. The plan was to build a tower higher than the CN Tower (1,815 feet) so that it can be called the highest free standing structure at the time. Unfortunately, because of it's proximity to the McCarran Airport and it's associated safety concerns, the height was drastically reduced to what you what you see now, at approximately 1,149 feet. In 1993, the Stratosphere Hotel Las Vegas caught fire during construction, which led to repairs and numerous delyas. It was able to open finally in 1996. A major addition was done in 2001 when a 1,000-room second tower was completed at a cost of $1 billion. 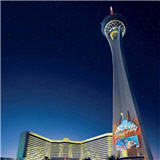 The Stratosphere Hotel Las Vegas offers over 2,300 standard guestrooms and 130 suites. Many rooms and suites give you unparalleled views of the Strip. Guestrooms and suites include satellite television and wireless Internet access for a fee. Select suites include separate sitting areas, bedrooms, powder rooms and kitchens. Select bathrooms contain spa tubs and separate showers. The Stratosphere Hotel Las Vegas 80,000 square feet casino offers every gaming opportunity imaginable. The revolving Top of the World Restaurant, which revolves 360 degrees in one hour and 20 minutes, offers a fine dining experience. Fellini's Tower of Pasta or Hamada Asian Village, The Crazy Armadillo Tex-Mex Grill and Oyster Bar, and The Courtyard Buffet fill the Stratosphere's dining options. The Stratosphere Hotel Las Vegas also has a 67,000 square-foot resort pool and recreation deck. The deck is located on the eighth floor of the Premier tower. In addition to the swimming pool the deck features private cabanas, a spa, waterfall, and a special events area. Enjoy refreshing drinks at the poolside bar and eats at the poolside cafe. Beach Club 25 provides a secluded adult environment. The Stratosphere Hotel has, on the 25th floor, table tennis, water volleyball, fitness equipment and space that can be used for private parties and functions. Located on the 103rd and 104th floors are six fully catered meeting and banquet rooms. The Tower Shops is an international marketplace that takes you on a cosmopolitan journey through the streets. The Tower Shops mall is conveniently located on the second level at the top of the escalator near the hotel's main entrance. 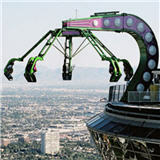 The Stratosphere has a lot going for it but the main attractions are these rides that are located right on top of the main tower. These rides would be boring if they were on ground level, but placed on top of a 1,000 feet plus tower, it's a totally different heart-attack inducing experience. The Xscream is a coaster that teeters over the edge of the tower, the Insanity just dangles you and tilts its cars as if it's going to drop you on the Strip, and the Big Shot is a standard drop tower ride but ten times more intense since it's right on top of the tower! For 2010, a new thrill ride called SkyJump is scheduled to open in April. It's a Bungee jumping-like ride that will allow riders to plummet close to 900 feet while attached to a bungee cord. Cool! 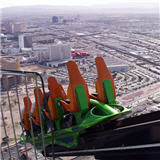 If you are to squeamish for these rides, just go to the top of the Stratosphere tower for the view, especially at night. It is well worth it.